LG confirmed today that it will be launching a white version of its popular Nexus 4 smartphone on May 29, starting with Hong Kong before a wider roll-out across Asia, North America, Europe and the Middle East in the coming weeks. The refreshed Nexus 4 will be equipped with exactly the same hardware as its predecessor, including a 4.7-inch display with a 768×1280 resolution (318 ppi). It’s powered by a 1.5 GHz quad-core Qualcomm APQ8064 Snapdragon processor, as well as 2GB of RAM and either 8GB or 16GB of internal storage. There’s an 8-megapixel rear-facing camera capable of shooting 1080p video at 30 frames per second, as well as a weaker 1.3-megapixel counterpart on the front. It also features the same non-removable 2100 mAh battery and doesn’t support LTE connectivity. Perhaps most importantly, the white Nexus 4 runs stock Android out of the box, without any form of pre-installed skin, themes or apps (i.e. bloatware) from LG. The original Nexus 4 is still an incredibly affordable device, but faces some stiff competition these days from the Samsung Galaxy S4 and HTC One. Both have received considerable spec bumps over their predecessors – the Galaxy S3 and HTC One X – but cost considerably more than the Nexus 4 as a SIM-free version. 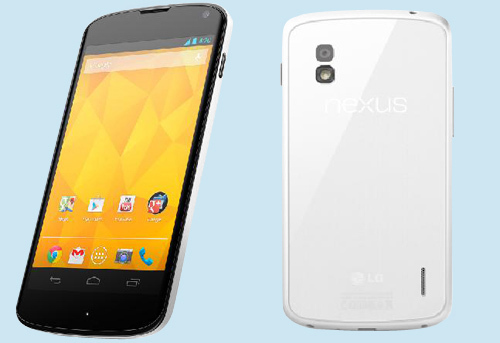 There’s no word on pricing for the white Nexus 4 just yet, but we’re betting it will be similar, if not the same as the black color variant. Google also unveiled a ‘Google Edition’ of the Samsung Galaxy S4 at its annual I/O developer conference. The new variant also runs stock Android out of the box, making it a compelling choice for developers and those looking for a so-called ‘pure’ Android experience on their smartphone.